Even though we were quite tired after coming down from Sigiriya, we were enthusiastic enough to aim our next destination Polonnaruwa on the same day. So we quickly rushed back to our stay in Sigiriya or a sumptuous lunch and freshening up before we started. Polonnaruwa became the capital of Sri Lanka after the decline of Anuradhapura and reached its zenith by 1150 AD. Surrounded by 6 km long ramparts, it strategically commanded the lands around River Mahaweli. Polonnaruwa’s well-preserved ruins offer a fascinating glimpse into the civilization of ancient Sri Lanka. Ruins of royal castles and Buddhist temples and monasteries abound, Royal Palace Group, The Quadrangle, the Polonnaruwa Vatadage, The Tooth Relic Temple, Shiva Devale, Alahana Pirivena, Rankot Vihara, Lankatilake, Kiri Vihara, Gal Vihara and Potugal Vihara. Since the city was pretty compact, we were able to cover most of it in half day. Let’s move to a less verbose and more pictorial description of Polonnaruwa, I will be giving small descriptions of the places and monuments. Since we were already carrying the Circular Tickets, did not have to buy tickets here and went straight to the Royal Quarters. Two significant monuments here are the Royal Council and the Royal Palace. Royal Council, as the name suggests, was the Court of the Kings where the aristocracy would discuss the affairs of the state. Close to the Royal Council was the Royal Palace of the most famous king of Polonnaruwa, Parakrambahu.The palace in its heydays was a massive structure, seven stories in height. All that remained now was the gigantic lower walls and the chambers on the ground floor. However by the scale of the ruins, one could imagine how majestic this palace must have been once. Close to the Royal Quarters, on the Southwest is the Polonnaruwa Vadatage, one of the most important collections of monuments in the ancient city. The Vadatage is a Reliquary – a container for the relic. It was the home to the holy tooth relic of Buddha in the days of the city. The main shrine (above) was a beautiful circular monument with four statues of Lord Buddha facing each of the four directions. At the base of the shrine, there were the famous moonstones carved in stone. 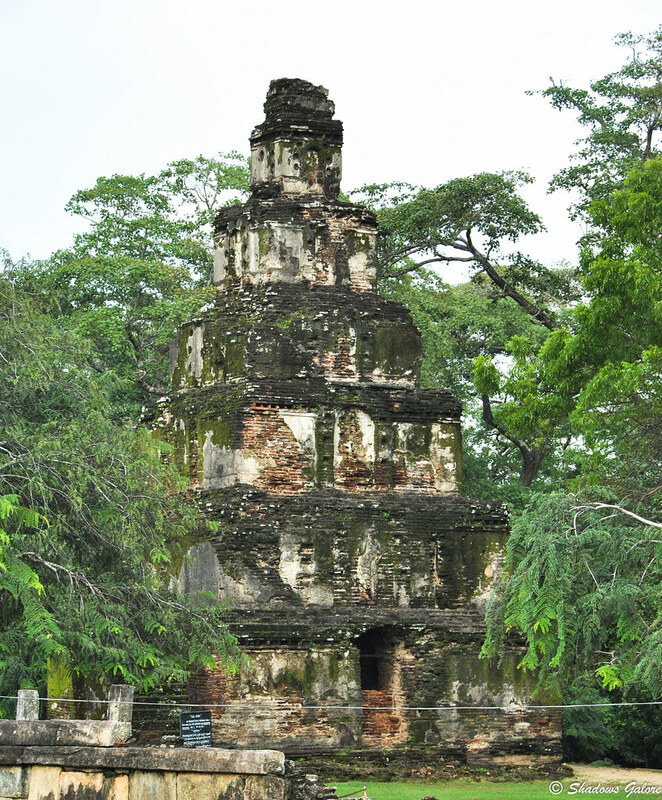 Kiri Vihara (meaning milky white temple) is the best preserved Stupa in Polonnaruwa. It derives its name from the white plaster adorning its surface, a part of which survives till date. The stupa is huge by any standards and has numerous prayer chambers and image halls surrounding it. Next to Kiri Vihara are the monks quarters and remains of an ancient hospital. This was a building which held me in awe like none other. Rising to a height of around 20 mts, this magnificent structure built by Parakrambahu sheltered a huge statue of Buddha. The walls were adorned with beautiful murals and the front of the entrance depicted an equally beautiful nagini/ yakshini in the South Indian style. The roof is missing but indicates that it had a domed structure at the top. The last and perhaps one of the most famous monument of Polonnaruwa, is the Gal Vihara (Stone Vihara). This monument has three huge statues carved out of Granite and one smaller statue tracing origins to the Mahayana sect. The leftmost statue is of Buddha in a Dhyan Mudra signifying Mahayana influence, the standing statue keeps people arguing about its significance. Some say its the most famous disciple of Buddha, Ananda and some say its Parakrambahu himself. On the rightmost is most fascinating of all- a 46 feet long statue of Buddha in a reclining position. You need to see it to ascertain the exact impact it leaves in your mind. So this was about our visit to the ancient city of Polonnaruwa. Although high on archaeology, I hope I kept it short and simple. 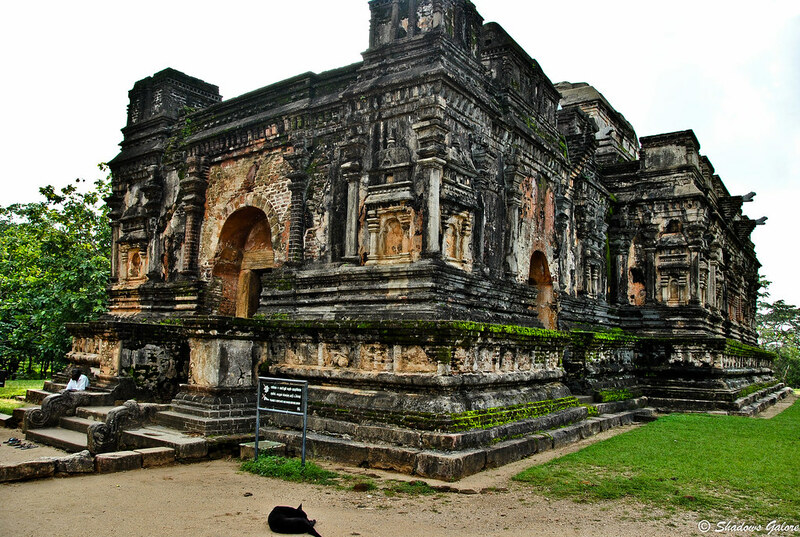 If you want to have more dekho into what Polonnaruwa has to offer, check our Flickr Gallery. If you are in Sri Lanka, do keep this place along with Sigiriya on your list. You may also like Travel Tips to Sri Lanka by Ekta. Polonnaruwa, a set on Flickr. I have came through this place, in a tamil book, Poniyin selvan. but a different name. Fantastic post, Puru. I particularly loved the reclining Buddha. Lovely place , nice to know about it more . Amazing photo of Lankatilaka Vihara Puru! Black and white is a such a good format for ruins sometimes! Seems like a great place. The pictures are wonderful. I just got back from a safari today, started the laundry and checked my e-mail and now 2 hours later I am adding Sri Lanka to my travel list!! Gorgeous photos!